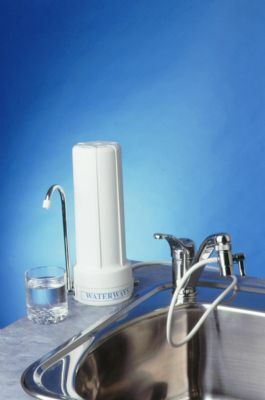 WATERWAYS Counter-Top Water Purifier utilises the CC1 Activated Carbon cartridge to produce approx. 4,000 litres of purified water. Install Waterways at your home or office today! Bottled water 15 litres average cost $9. Waterways CC1 15 litres cost 0.34, save $8.66 per bottle! Counter-Top needs cartridge (1) every 12 months – cost $109. The unit sits neatly on the sink and attaches to the tap. By turning on the tap, and pulling-out the pin located on the attachment (screwed onto the tap), the water diverts to the unit and is then dispensed through the spout on the side of the unit. When the tap is turned off the pin automatically reverts to the original position allowing for normal water flow. Copper in your drinking water can cause serious health problems Waterways filters are used and recommended by doctors and naturopaths throughout Australia. Waterways CC1 (USA) Carbon Filter removes 99.9% copper plus high percentages of other heavy metals, chlorine and bacteria. Independent testing has been carried out by a South Australian Government Laboratory. The CC1 Filter is one of the world’s biggest selling filters due to its advanced technology. Nutritional & Environment Medicine practitioners, using hair analysis, have discovered high levels of copper in a large percentage of people tested. Some of the major problems experienced by people with excessive copper are joint pain, chronic, fatigue, hormone imbalance, anxiety, depression and cancer. Copper piping has always been identified as the major source of contamination.